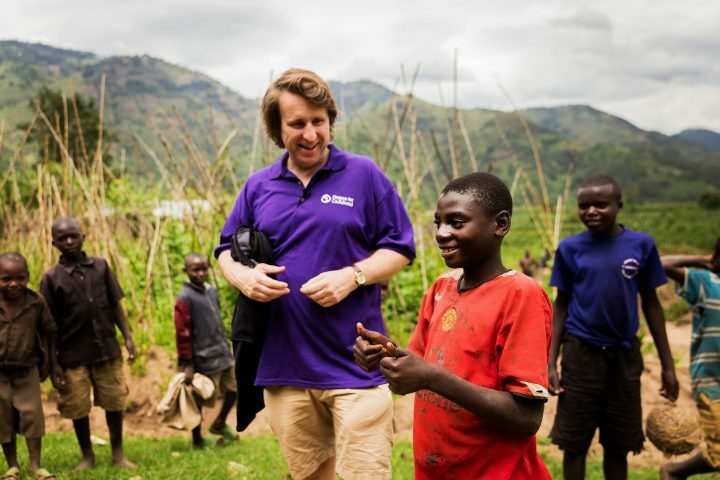 Chance for Childhood patron Milton Jones reports back from a recent trip to visit our work in Rwanda. Daniel runs towards us up the muddy track on the side of the emerald green ravine. He hugs one of his teachers and they begin to animatedly talk in sign language. I can’t follow any of it. The twelve year old walks with a slight limp, but only a few years ago he was suffering from malnutrition, tied to a post and was put to bed with the animals, and all because he was born deaf. In beautiful but poverty-stricken rural Rwanda a disabled child is often still seen as a curse from God, an embarrassment as well as another mouth to feed, with no chance of them ever earning a living. The stigma is so strong the child can even have no name, and they’re just known as ‘deaf’ or ‘the blind one’ – their disability becoming their very identity. This is the opposite end of the world. Where I come from we comedians spend large amounts of time and money endlessly promoting and Googling our names. For the last few years Chance for Childhood have sent out search parties into these verdant hills in search of such hidden children. When found, their parents are invited to disability-specific two-day camps – one for deafness, one for cerebral palsy, etc. They’re given practical help and counselling on how to cope with their ‘curse’ both medically and emotionally. To win the parents’ trust and stabilise their finances sometimes they are offered a baby pig or two, as long as they pass on any offspring to someone else who might need it. The next stage is to get the child into a special school. We visited the deaf school in Musanze briefly earlier and the 34 children of different ages seemed more like a family than a boarding school (Headmaster Louis lost most of his real family in the genocide of two decades ago). In one of the shacks that surround a courtyard, there are a few donated computers, and at break, pupils were busy Skyping other deaf kids in Africa with much animated silent chatter and grinning. So much grinning! There’s more to smile about now. Some of these pupils are being put into mainstream schools with their very own learning support assistants (LSA’s). After that a job’s the goal, and being able to earn money for the family.